I finished block #4 today! For some reason it seemed like it took me forever! 40 ct. Vintage Examplar, NPI silks (1 over 2). Fabulous work Nicole! I can't wait to see it all completed! Gorgeous work. No matter how long it takes you, I guarantee you are still faster than me. I'm *still* on block 1. Yay! One more block! (Of course, this is where I'd stop, because I just can't seem to finish anything.) But YOU will finish, and it's just perfect! Oh Nicole this is so beautiful! The colors are so rich and your stitching is awesome. I love this house! You are so close to a finish! That is just awesome!! This has got to be a record for completing a Hawk Run Hallow piece! Good luck on that last block! Can't wait to see it in all its finished glory! No wonder it took "forever" - it's a brick house! Look at all those counting and colour changes! What a pretty block! Can't wait to see it all finished, Nicole! Love this! 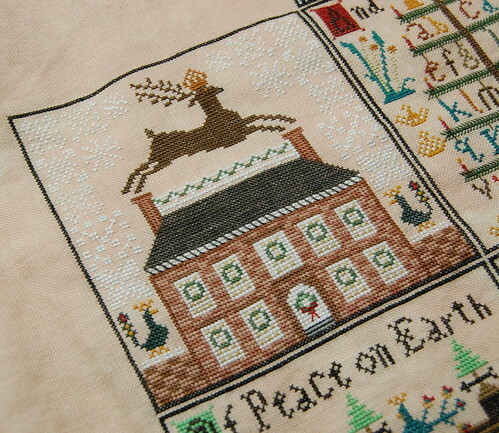 I can't believe how quickly you have sped thru this huge piece - your stitching is beautiful as always. Your stitching is fab!! I only wish I could stitch as fast as you. Too bad I don't live in your state - I'd love to have you as my mentor. Wow, that's lovely! you are so close I can't believe it. can't wait to see the whole thing completed. That's great! Can't wait to see the finished piece. No,I can't believe it either:o) What a fantastic job you're doing, Nicole. And your stitching always looks so darned neat and fabulous! Can't believe you only have 1 block to go. Wonderful stitching. It looks wonderful Nicole! I can't believe that you only have one more to go!! YGG! And that block probably felt like it took so long because you're so close to the end with this great piece and you probably want to be finished in time for the next project. It always seems to go slower when it's something that you want to finish up!! I am cheering you on to a finish! Great work, Nicole. I can't believe you are almost finished! As someone else said, that must be a record! What a lovely block! Go, Go, Go! Gorgeous, you are so close. Can't wait to see it all finished :-). Maybe it was because of the bricks on the house...all those different colors. Wow! You are going to be done soon! LOVE IT! You are almost finished! That's amazing. 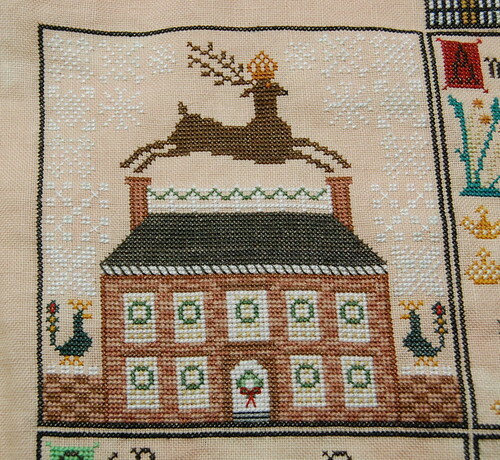 I do love the crowned deer in this block. I can't wait to see this finished and I'm sure you have it done by the end of the weekend! Congrats on having another block done, it's gorgeous! Just one more to go!!! It's beautiful and can't wait to see it finished. One more! :) Congrats! Very interesting work!!! Great job! One more block done...you will be finished before you know it! I love brick houses but boy do they take time! Happy Stitching!